Chances are you’ve had plenty of gym memberships but found them too expensive, their hours too inconvenient, and, perhaps worst of all, too crowded. These are just a few of the reasons so many people today set up their own at-home gyms. Regardless of your fitness goals, an at-home gym can be every bit as effective as big-name gymnasiums. Some people believe limited household space equals a poor workout, however, this is where a dumbbell set, along with some muscle building protein supplements, can be your new best friend. For those who have room for a larger setup, a complete dumbbell weight set, including a rack, can be a worthwhile investment. 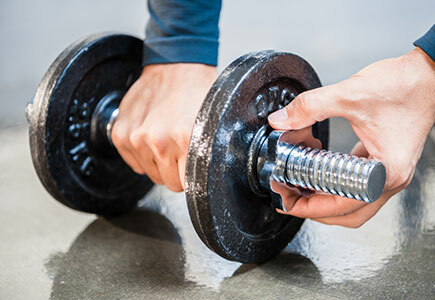 It doesn’t matter if you are new to weightlifting, setting up an at-home gym for the first time, or if you are a long-time exercise enthusiast, dumbbells provide an excellent, muscle building workout that brings many health benefits. Don’t forget that for many people, you will need to invest in a weight bench to get the maximum results. Fixed Dumbbells or Adjustable Dumbbells? It’s clear that purchasing a dumbbell set is an investment in health that is sure to pay off with regular use. Now you must choose between fixed dumbbells or an adjustable dumbbell set. Let’s look at both types so you can make the best decision for your situation. 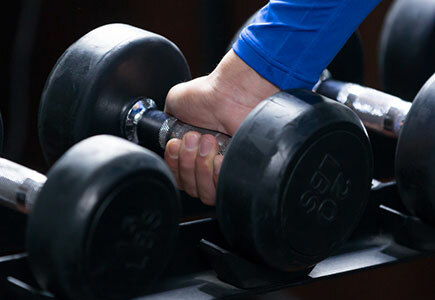 As the name implies fixed dumbbells come in one weight and cannot be interchanged. These come in increments such as 5 pounds, 10 pounds, 30 pounds. These types of weights are sometimes called hex or cap dumbbells because of the shape of the weights on the ends. Hex dumbbells have hexagon shaped, flat ends, while cap dumbbells have a ‘hat’ or capped ends that are fixed in place. To save space, you will probably need to buy a dumbbell rack set to hold and organize the weights, which add additional cost. When it comes to adjustable dumbbell sets, the difference is all in the handle. One mistake you want to avoid at all costs is to buy a cheap set of handles that strip, bend, or break apart easily. Not only is this dangerous, but it can be costly to replace the handles every year or so. Pro Tip: Buy the best quality handles you can afford and buy the longest ones possible. You will be adding more weight as you get stronger. The longer the handle, the more weight you can add. If the handles are too short, you will need to buy another set for heavier weights. There are two types of handles, the link to spin type and weight fastener type often called the Olympic handle. First, let’s talk about these very different handles. A good set of links to spin lock handles can take as much as 100 pounds of dumbbell weight plates (if you are using 25-pound weight plates). These types of handles have threaded ends you mount the weight to, then spin on a locking fastener so the weight does not move or fall off. These types of handles take an extra minute to screw on the fastener, but they are very safe. These are the favorites of professionals because weights can be added quickly. Olympic style handles use a fastener called a collar which slides onto the end of the handle quickly and is held down with an “L” shaped handle, similar to an Allen wrench. While changing weights is faster, if the collar is not securely fastened, it can allow the weight to slide off, which can be dangerous. If you have decided that an adjustable dumbbell set is right for you, then you’ve conquered half the battle. We’ve narrowed the choices down to the top 3 models and picking just one from these beauties will be a difficult choice! This adjustable dumbbell weight set is top of the line and cream of the crop. If you are super space conscious, this premium set of dumbbells are for you. Super easy to use, there is no need to unscrew locking mechanisms or worry about weights possibly falling off. You select the amount of weight you wish to use by turning the dial to the appropriate number and the weight is automatically added or removed for you. Bowflex is a very popular brand of workout equipment that’s been around since 1986. They are best known for their resistance workout benches. The company has been so successful that it has acquired many other exercise manufacturers, including Nautilus, Stairmaster, and Schwinn Fitness. If you are an exercise fanatic who believes that purchasing top-of-the-line products is an investment in good health and fitness, this will meet both your needs and desires. If saving space is of premium importance to you or if you don’t like messing with complicated locks and guides, the simplicity of the Bowflex SelectTech 552 Adjustable Dumbbells is a smart choice. Good looking and durable, this cast iron adjustable weight set uses star type lock collars with threaded ends on the handles for a super secure locking mechanism. These are sold as a pair and extra weights can be purchased as desired. The weights are cast iron with a black paint finish, making them incredibly durable. A knurled grip on the chrome handles allows you to keep a steady hold with a minimal amount of slipping. The star locking mechanism comes with rubber gaskets to avoid damaging the paint on the weights as well as avoiding those clanking noises when lifting. Even for those with smaller hands, the star gear itself is large enough to use comfortably. Established in 2010, the company has already carved itself a hefty niche in the world of sports and fitness. This is an American company, based in California. They offer a wide variety of exercise and yoga equipment, including balance trainers, kettle balls, and products for strength training. For those who are interested in a basic, yet durable set of adjustable weights and don’t care about the brand name, these would be a perfect choice. The Yes4All Adjustable Dumbbell Set is high quality, practical, and affordably priced. This is an affordable and versatile adjustable dumbbell set for the beginner or more advanced weightlifter. The standard 1 -inch handles are 100% steel, enabling them to hold up to 100 pounds each! The cast-iron plates are enamel coated, making them less prone to chips and super durable. The handles have knurled grips, making them safe and secure, even for those with sweaty palms. This setup uses the star locking system, which means easy off and on with a very secure hold on the plates. One of the big plusses for this set up is the free plastic carrying case. This makes storing or moving weights as easy as carrying a suitcase. Extra weight plates can be purchased in almost every sporting goods store or online. One of the oldest names in weight training, CAP is based in Texas and has been incorporated since 1982. The company is best known for its basic, down-to-earth products that boast class, not flash. If you are a “don’t need fancy stuff, just give me the basics” kind of person, but you still expect quality from your products, CAP is the brand for you. Sturdy, durable, high quality at a very reasonable price means you will have little need to upgrade, replace or repair. If your heart is set on a set of fixed weight dumbbells, we want to show you the top-rated sets we recommend. This neoprene coated, hex dumbbell set is both functional and good to look at. This dumbbell set with rack includes 3 sets of weights. Included weights are 2,3, and 5 pounds or 3,5, and 8 pounds. This dumbbell set comes with a two-year warranty. Additional weights are available, but they won’t fit on the rack. Additional dumbbells are sold in pairs only. BalanceFrom is a California based company that was established in 2012. They specialize in yoga, exercise equipment, and precision bathroom scales. For the beginner or for those who aren’t interested in bulking up, this is a nice set that is easily tucked away in a corner. The super-affordable price for 3 dumbbells, along with a liberal 2-year warranty, are the main reasons that this fixed dumbbell set with rack stays on Amazon’s Best Seller list. For those who want the basics but still want the best, this CAP brand of rubber dumbbells will fit the bill. Chrome plated, knurled handles mean a sure, non-slip grip and rubber coated weights mean durability plus! This dumbbell set is sold in the 5-50-pound range. The hexagon shaped weights mean that they will not roll away while working out. The weight number is stamped into the rubber, so it won’t wear off like painted numbers. For those who want a basic set of dumbbells that will last for decades (with proper care) these are a sure winner. The CAP name is known for quality and durability, so you know you are getting a great product for a fair price. These dumbbells come in weights that are more than adequate for most home-gyms. The classic dumbbell is made from cast iron, painted to prevent rusting and virtually unbreakable. This timeless set of dumbbells from the trusted CAP name are simplicity plus! This hex dumbbell set goes from 5 to an incredible 120 pounds. Sold in sets or individually, depending on the weight, this set allows you to buy what you need and not waste money on weights you might not use. If you love the classics and want a name you can trust, this hex dumbbell set can’t be beat. While it might have a few drawbacks, they are outweighed by the quality and price. CAP doesn’t list a warranty time for these, but reviews state the company is extremely responsive to requests for service. The decision as to what type of dumbbells work best is truly personal. Determine your preferences, needs, and, of course, budget before making your decision. Dumbbells can be one of the best investments in your health that you can make. Taking the time to consider your workout goals, space, and wallet will help prevent you from overspending or being frustrated with the amount of space involved. If you have any tips on purchasing dumbbells or if you love the set you have, we would love to hear about your experiences. The post Best 6 Dumbbell Sets for the Home Exercise Enthusiast appeared first on Livin3. A Review of SkinnyMint: Is it Backed by Science? Previous story Selena Gomez: Living Her Best Life Without Justin Bieber!